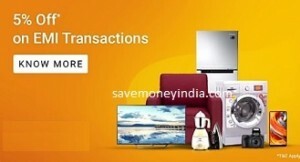 • 5% Instant Discount on EMIs with Axis Bank Credit Card. • Offer will be listed on product page, for all eligible products. • Minimum cart value: Rs. 6999. • Maximum discount per card: Rs. 1000. • The Offer is valid from 25th March, 2019 (00:00 Hours) to 31st March, 2019 (23:59 Hours).